Since I'm hanging out at the Energy Solutions arena this morning collecting canned food for the Utah Food Bank, Revellie was gracious enough to step in and entertain you. For my second blog, I thought I would start where Josh and I started...Chickens. Backyard chickens have been a recent hot topic for us hip urban convenience environmentalists (don’t get upset…I am lumping myself in there too). This IS a good thing though on many levels (click on the links below for more information - that was the plan but then I found http://www.mypetchicken.com/backyard-chickens/chicken-care/chapter-1-why-chickens.aspx which pretty much summed it up for me). • Chickens are pretty awesome and personable creatures. • Happy eggs come from happy chickens. • Stickin’ it to the Man. We started off with 4 chickens and a converted rabbit hutch (basically a rabbit hutch with the front panel cut out and 2 laying boxes attached). We were worried about them flying away and neighborhood cats getting wind of them so we locked them in the hutch at night. We actually did lose a one of our Leghorns one evening. Josh and I wanted to look in the neighbors back yards but did not know how to start that conversation with them. Later we found the chicken in a tree (something we still laugh about today). Then we found a very inexpensive dog run on our local community ad site (similar to CraigsList). That became our chicken run. We put a piece of variegated metal (purchased at discount from a scrap metal yard) on the top of it for a roof. Ahhh… shelter for our chickens. • Chickens need to eat every day. If they are hungry, feed them. • Chickens need to be in a certain weight range before they start laying eggs. Also, I learned that an egg is…well…an egg just like ours (females) but it gets released everyday not just once a month. So after laughing at ourselves for a few weeks for our naivety, our chickens started laying eggs. We were on cloud nine. Here are a few other tidbits I have learned about chickens. • When they get use to you, they really perk up when you come around. If you are not going to eat them, then they will make pretty cool pets. I have had one take something right out of my hand. We also had a bantam (tiny chicken breed) that sat on my shoes every time I came out to visit her. • Chickens love dust baths and will dig a hole and just lie in it. • Chickens love digging (they dug up all my strawberries!). We put them in our garden (after seeing what they did to my strawberries) and they prepped it for spring for me. • Chickens love worms and snails. Throw them a snail and watch them chase each other around. We also watched one kill a mouse the other day. I can see that this is getting quite long and I wanted to talk about ducks as well. I may have to do a part two so I can share with you about how we discovered ducks. As I close, please know you do not have to get chickens. It's not a lot of work but it is still a commitment and if you can't make the commitment, please don't. If you want to make a difference, consider buying local farm fresh eggs. Not the "organic" eggs from the grocery store. We all know that "organic" and "free-range" are loosely defined for massed produced products (it doesn't take a genius to figure that one out). By buying farm fresh eggs you will also get awesome eggs, keep your dollars local, and your carbon footprint will be minimal (a semi-truck did not deliver your eggs). If you can't wait to hear what I have to say about ducks, you can listen to The Goat Cast (thegoatcast.blogspot.com) for a more in depth approach and hear Josh interview Christy Brown from SunnyBrooke Farms (she has become our in-house expert on all things avian). My boyfriend would definitely freak out if I started raising chickens...lol. I guess I will have to find a local egg source. New GFC follower stopping by from follow us monday hop. If you get a chance please stop by my blog. have a great week! Thanks for following. I am now following with GFC as Bonnie. What a great Chicken story. I am looking forward to reading more. 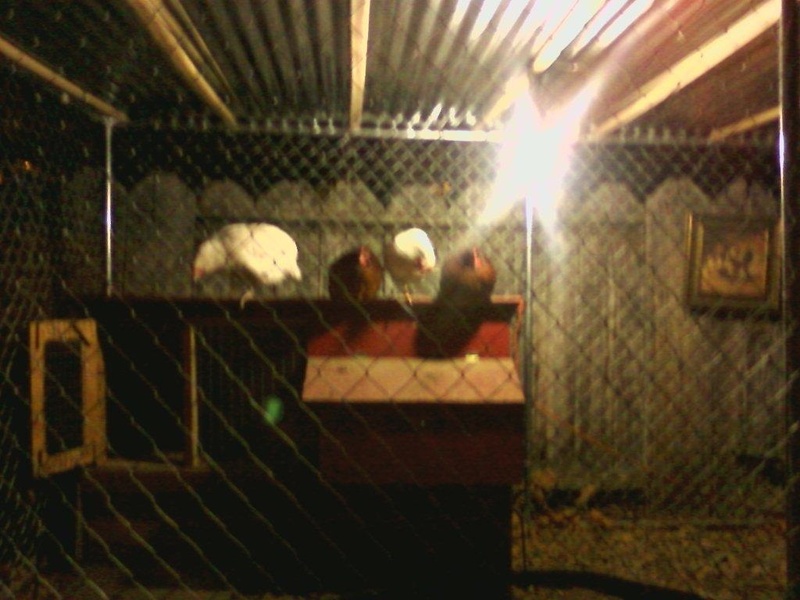 I have been raising chickens for around 5 years now. I started with 25 laying hens. Now I only have a few left. I started traveling a lot and had to give them away.